Netafim 3-Way Series 80 Nylon Control Valves include the solenoid and three pilots mounted directly on the valve bonnet. 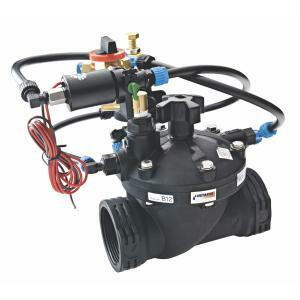 This pressure reducing electric model provides pressure regulation of your irrigation zone at the valve. The clog free labyrinth inlet allows the Series 80 globe valves to be used in dirty water applications. With quick reaction to opening and closing and a drip-tight seal, the series 80 valve is perfect for precision irrigation. Easy reach flow control knob allows manual operation from fully closed to fully open even inside a valve box. Applications include greenhouse and nursery, including hydroponic and mist systems, as well as standard irrigation systems where you want precision watering.